Earth Hour is a global event organized by WWF in an attempt to raise awareness towards the need to take action on climate change by asking households and businesses to turn off non-essential lights and other electrical appliances for one hour. 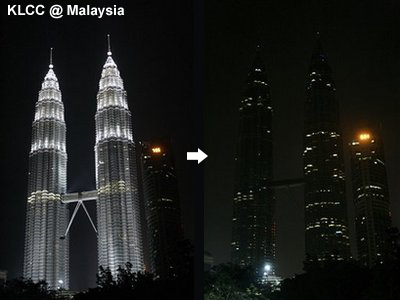 By support Earth Hour, please take part in Earth Hour on 27 March 2010 and turn off your lights at 8:30 – 9.30pm! p/s: You can enjoy 25% off total bill for orders made while our lights are out. Participating stores are KLCC, Lot 10, Pavilion, Ampang Point & IOI mall-Puchong on 27 March 2010!